I finally finished the bag yesterday afternoon, after an episode of seam-ripping. Right away Emma filled it with library books so I had to take it back and do a little reinforcing on the handles. I really like how it turned out. I love this next group of photos and I couldn’t choose just one to post. So I’m posting them all. I like the progression of the shots. They are from my kitchen floor, and might explain why it takes me about three times longer than it should to get dinner on the table. They are having so much fun. I can’t wait until my two are playing together. I really like that bag. Did you follow a pattern? 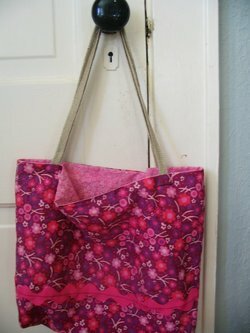 I want to make a bag, I always think I can just make it up as I go along, and it never really works out well, so maybe i’ll try following directions somtime. fabulous bag! I just love that fabric. the pics are hysterical and boy, can I relate.